Stewardship Sunday was November 11, 2018. Live a life worthy of the calling you have received. A life worthy of the call God has placed in your life. These words from Ephesians 4:1 resonate with a question we can’t help but ask ourselves in our everyday lives, “Is this worth it?” We want to know if the things in which we have invested our time, energy, heart, and resources are worthwhile. I know God created me. These words resonate with our own realization that God has given us an incredible gift, and it is ourselves. God calls us to use that gift to serve as Christ in our families and neighborhoods, in this church, in this community, and in the world. This year, through a process of careful listening, the servant leaders of Shady Grove United Methodist Church hear God calling us to be “a connected church, a serving church, a church where we grow together in Christ” as our overarching work. This call we have from God sends us into our community, which longs for balance and meaning. God has given us something to live and share that is beyond worth it in this place and time. Our stewardship theme for 2019 is Beyond Worth It. The four weeks leading up to stewardship Sunday, we will focus on how our value is defined by our work and the power of money, in contrast to God’s call and the legacy and hope we leave. Stewardship Sunday is November 11, 2018. We ask you to reflect on the gifts God is inviting you to share. We hope you will join us to celebrate all that God has blessed us with and offer your commitment to God through the ministry of Shady Grove United Methodist Church for 2019. This year we complete the process of moving our fiscal year to align with the calendar year. 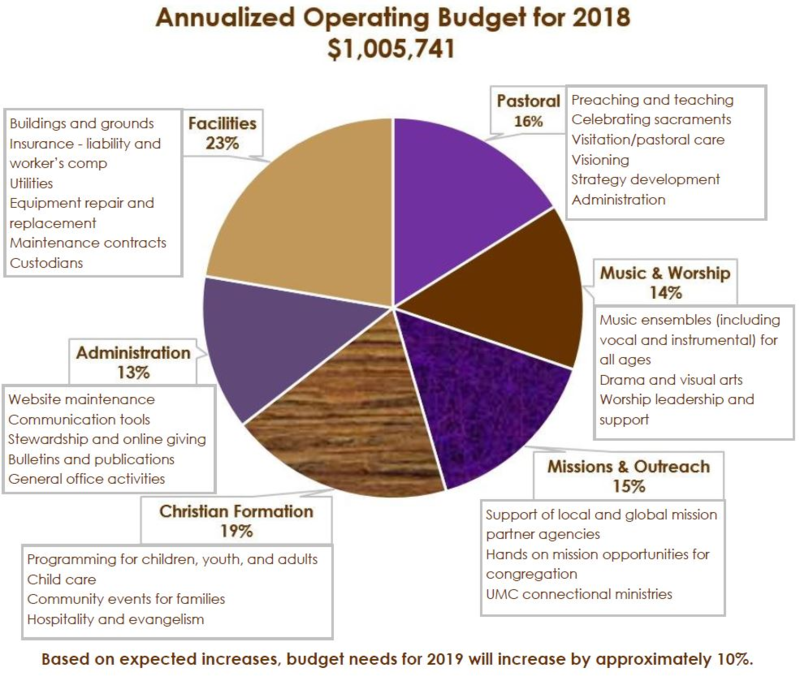 The narrative budget shows how financial commitments to the operating budget are used to help more people in our community know and grow in Christ. Questions about your giving at SGUMC? Contact Pam Sweeney at psweeney@shadygroveumc.net or call the church office, 804-360-2600.